A loosely woven series of coming-of-age tales set in 1960s America. In this collection, Herron (One Way Street, 2014, etc.) tackles big themes: mental illness, war, loyalty, abuse, friendship and family. Readers might easily get lost in such broad terrain, but Herron keeps them tethered by a unifying question: How are memories constrained by perspective? In his foreword, Herron describes the book as both anthology and novel; chapters share characters and settings but offer original details and points of view. The first is in small-town America, 1962. Paul, a teenager, watches a new family move into the house across from his on Reichold Street, and he confronts Albert, who looks like a bully, for the first time. Over the next few years, Albert’s stepfather, Carl, terrorizes his family and the neighborhood with drunken abuse as Paul tries to help and Albert rebels. Readers learn to hate Carl while losing hope for Albert. 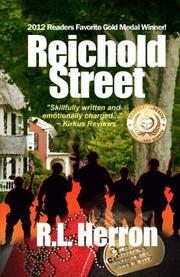 Subsequent chapters, told by Carl, Albert, their family members and other kids on Reichold Street, add layers to these events. Carl’s chapter, seen through his confusion, medication and booze, offers a frightening yet compassionate view of mental illness and its stigma, especially in the ’60s. These opening chapters are the strongest in the collection; the characters are bold, the plot twists surprising, and the point—that we never fully know a person or his or her story—heartbreakingly clear. The middle sections, related by minor characters, add little to the overall narrative; some read as filler, although one, told by a Reichold Street kid lured by organized crime, makes a fine stand-alone story. Toward the end of the book, Herron returns to Albert, his two tours in Vietnam and the pall of that war over American youth. Through flashbacks to Reichold Street, readers further witness Carl’s lifelong, devastating influence on Albert; an additional chapter from Carl’s perspective would nicely round out the book. Skillfully written and emotionally charged.